As my kids were growing up - there was always a fun battle of who loved who more.. though it continues, its more like a From the Moon and Back battle. 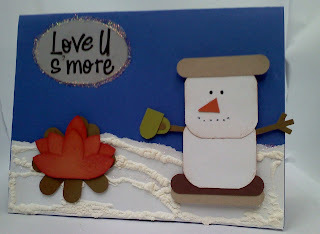 I got this idea when making Christmas cards, since I usually incorporate a snowman, somewhere down the line, and yes, usually its made with punches. Most of the CS here is scraps that I had, which makes this more fun! I did have to get alittle more creative on the face- because lets "face" it.. marshmallows aren't to have faces, but I just dotted a pair of eyes and mouth on the fellow. I think hes awesome! I like the fact that I found my ever lost puffy paint, for the snow factor. It tops it off! Hope you stay toasty warm today!